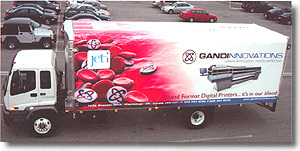 Digital Print: "Provides an Over the Road Advertising Solution"
Today An Ordinary Tarp ... Tomorrow A Travelling Billboard! Aero-Kit Industries and Tarp Technology Innovations have recognized that in today's transportation industry, return on your investment is very important. 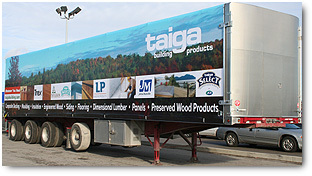 Take advantage of guaranteed technology with the concept of traveling billboard advertising on your soft sided trailer. After all, the cost of supplying a truck, trailer and driver is already a constant, so why not invest in what you're already paying for? Full page 4 colour processing in most major publications is about $3,500.00 per issue x 12 issues is $42,000.00 annually. With the life expectancy of digital print on vinyl with a micron clearcoat being (4) four years, your company would expense $168,000.00 on print advertising over that period of time. Billboard advertising "over the road" with digital print would only cost approximately $8,000.00* for a 48' trailer (including both sides and rear flap). What's stopping you? Aero-Kit's Marketing and Graphic Design Department is fully functional with proven results in creating dynamic advertising at the lowest possible cost. Digital Print Advertising "Over The Road" is guaranteed to take fleets and manufacturers to the next generation for promoting corporate messaging. Fortune 500 companies have already taken to digital advertising on highway van trailers by allocating a percentage of the corporate advertising budget to where the public spends a part of their day "stop and go" traffic. The LOOK® is designed for any corporate message that you and your customers want to advertise and we can design it in house. Did you know that North American Statistics say that a traveling billboard offers 50% more viewing audience over a stationary billboard. On an average that's 45,000 viewers per day, 250,000 per week, 1.08 Million per month and 13 Million per year of Bang for your advertising Bucks!!!!! 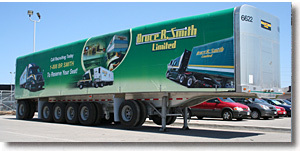 Soft Sided Trailers - Your Next Advertising Tool!